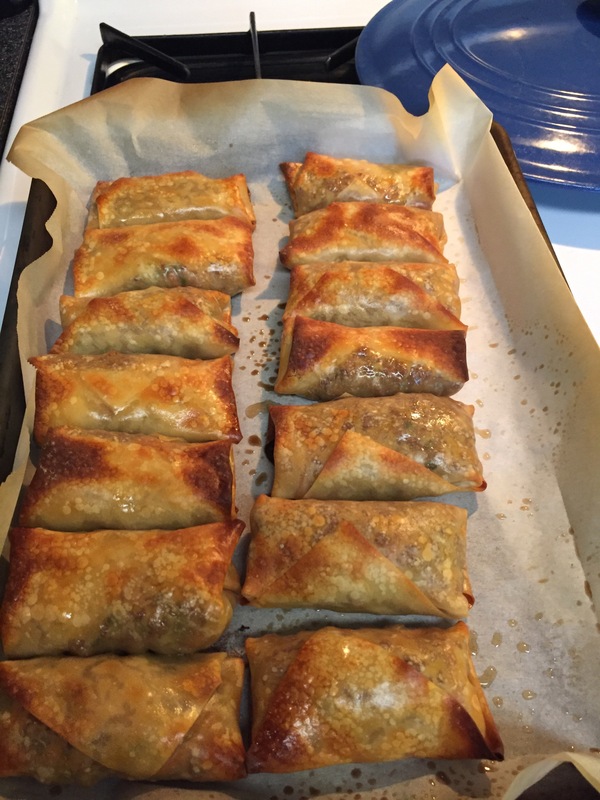 To follow up with the request from Carmen for cooking help…she wanted Egg Rolls. I used to make these in large batches (small children, busy family), and haven’t made them in a long while. I mix the cabbage, carrots, parsley, and scallions in a large bowl. Brown the hamburger meat, drain fat (if any), add garlic, ginger and some salt and pepper. Mix with the cabbage mixture. Add soy sauce for flavor and moisture. (Be aware, too much moisture, and it will leak out of the egg roll.) Taste it, and add more salt and pepper if wanted. Cabbage should wilt a bit. Roll the egg rolls per the package directions, and place on a parchment lined cookie sheet. I freeze mine this way, and place them in zip lock bags for enjoyment anytime. Nasoya brand of egg rolls allows them to be fried or baked. I prefer our baked, so I followed the instructions on their packaging. Brush with oil, and bake in a preheated oven at 350 degrees for 15-20 minutes or until done. Serve with soy sauce, or a Thai chili sauce (yummy! ).